Medical experts speak about health disparities in the black community Saturday. The NorthShore University HealthSystem panelists emphasized the significance of healthy lifestyle choices and physical activity. Medical experts on Saturday morning discussed why the black community is more at risk for certain diseases but offered an optimistic outlook for the future. About 50 people gathered at Second Baptist Church, 1717 Benson Ave., to hear the panel, titled “Racial Health Disparities.” Panelists spoke about why black people have a higher risk of developing cancer, diabetes and cardiovascular disease compared with other races. 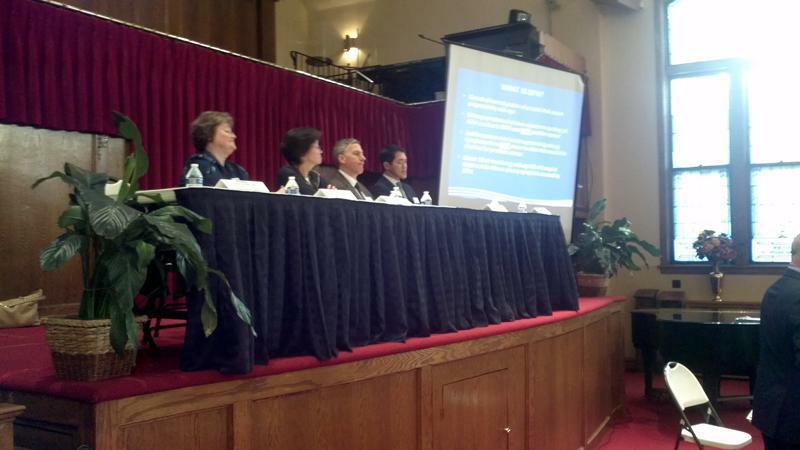 The panel included five medical specialists from NorthShore University HealthSystem. Dr. Charles Brendler, director of the Comprehensive Prostate Cancer Center at NorthShore, said black men are the most at risk because they get treated later, have less access to care and have a much lower quality of care than white people do. Men in general don’t want to talk about cancer and don’t want to get tested, he said. The result is that incidence of cancer and mortality in black men is twice as great as it is for white men. He attributed this to differences across social, racial and gender lines, as well as more funding for screening trials for white men than those for black men. Dr. Katharine Yao, director of the Breast Surgical Program at NorthShore, said the higher incidence of breast cancer in younger black women stems from a combination of health disparities and biological components. There are also underlying socioeconomic considerations, Yao said. “Poverty influences breast cancer progression through environmental and dietary factors,” she said. All panelists emphasized the importance of healthy lifestyle choices and physical activity. They agreed people can’t change their genetic makeup but can alter their environment. During a Q-and-A session, Brendler answered a question about how to best reach out to the black community to raise awareness for health issues.